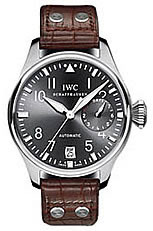 The Big Pilot’s Watch of IWC should actually be called Pilot’s Superwatch. This Pilot model gives quite an impression not only for its big case, but also the interior of this watch, made in Schaffhausen, is an authentic technical wonder with its automatic mechanism for 7 days and the automatic Pellaton winding system, that together with its imperturbable strength, has no equal. Its smallest calibers remain faithful to their thematic origin and shine with their functional time reduction strictly necessary for IWC Pilot watches. All that, of course, within the ultimate perfection.